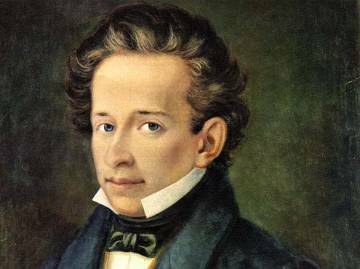 Giacomo Leopardi, one of 19th century Italy's greatest poets, was born in Recanati in 1798. His father, Count Monaldo Leopardi, was an impoverished aristocrat who had withdrawn from the world into the safety of his library, and encouraged his son to follow his example. By the age of sixteen Giacomo had read all of the great texts in Latin and Greek and knew English, French, Spanish and Hebrew. But the effect of his self-imposed imprisonment upon his health was not good - his eyesight began to fail and he developed curvature of the spine which gradually made him an invalid. By the age of twenty he had formed an unmitigatingly pessimistic view of life which was to influence his entire literary output. He saw life as tedious and purposeless and regarded any form of optimism for the future as a nonsense. Even technological advance, he thought, would lead to human misery. He saw it as the task of the poet to create the illusion of happiness which we briefly glimpse in childhood before it is snatched away from us for ever. He began his career as a poet in 1820. The heroes in most of his early poetry were patriots striving to overcome adversity. But his greatest poetry dates from the period 1829-1932 and includes La quieta dopo la tempestà (1829), Canti (1831) and Amore e morte (1832). However, much of his fame during his lifetime was established by his prose works which included dialogues and essays which he classed as Operette Morali (1827) and his Pensieri and letters. By 1833, his state of health was deteriorating and he and his companion Ranieri moved to the warmer climate of Naples. He lived and worked there until his death in 1837. He is buried there next to the tomb of Virgil.